To catch lots of crayfish, you need a good, productive, crayfish trap. But without bait, even the best trap isn't much good. To catch crayfish, you need bait. That's a simple and accurate statement. Here comes the difficult question. Traditionally crayfish traps in most countries are baited with fish. Swedes use sunfish, shiners and herring while Louisiana Cajuns often entice the crawfish with gizzard shad and pogies (menhaden). 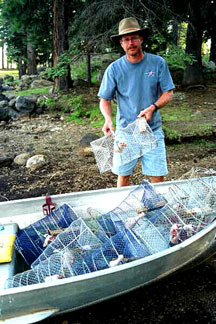 A commercial crayfisherman on the West Coast catches his crayfish with salmon heads and other oily fish. Lately, I had good luck using salmon trimmings from the local grocery store. For free! Yes, fish makes an enticing bait that usually surpasses all other baits. But that doesn't mean other sources of bait won't work. For years I bought cheap chicken necks and wings and had very good success with them. One store trimmed their chickens leaving the backs of the birds at a reasonable price. I brought home thousands of crayfish with chicken backs. But, as I said, each person has his own opinion about bait. A description about crayfish catching from Finland, a country that knows plenty about catching crayfish, included as good bait "a stealthily shot neighbor's cat". But it also mentions squirrels, chickens and other assorted animals as well as fish from the lake where the fishing takes place. But here is a warning. Crayfish bait must be fresh! Contrary to some people's opinions, crayfish don't like spoiled, smelly or sour bait, be it fish or meat. I found that out the hard way recently. I had several pieces of turkey necks left over from a successful 1400 catch in the mountains. After four days of keeping the bait unrefrigerated, I froze it after arriving home. Then, some weeks later, I defrosted the old bait and used it in a lake known for its large amount of crayfish. To my great surprise and disappointment, I caught very few crayfish under conditions that usually had been very productive. Analyzing the conditions that led to the dismal catch, I came to the conclusion that it was the spoiled bait. I recalled that, as I was baiting the traps, the bait felt slimey and obviously was too far gone to be considered fresh. It was just plain foul fowl! A few weeks later I returned to the same lake. This time I brought fresh bait in the form of fresh salmon trimmings from the local food store. With traps located in the same general area, I now had a good catch. I finally believed my friend and crayfish expert who had told me that crayfish demand fresh bait. It's simply a myth that they eat rotten food. THE MORE BAIT, THE MORE CRAYFISH! Again and again I find that the more bait I put in a trap, the more crayfish I catch. What probably happens is that as soon as the crayfish have eaten all the bait, they simply start looking for a way out of the trap. That explains why a Finnish article about crayfish catching stated that up to 75% of the crayfish in an overnight trap eventually escape. Well, wouldn't YOU start looking for the exit if you either had had your fill or if you found that all the food was gone? Many crayfish traps have some kind of an escape stopper, some quite efficient, some not. But here is the solution to crayfish escaping a trap. It has been well documented that as long as a trap has good bait in it, crayfish who have already entered the trap, will stay there while new crayfish still will be entering the trap. Once I discovered this secret, I found that my traps were much more likely to be full of crays, whether the trap had an escape stopper or not. So, keep your traps filled with good bait, and you will catch more crayfish. When you empty traps that have to be checked every three of four hours, be sure to bring some fresh bait. Often the traps are simply empty of bait. And empty traps don't catch crayfish. This rebaiting can be tricky in the dark, but it pays off. Some trap manufacturers supply their traps with a little container for bait. The idea is to let the scent of the bait entice the crayfish without letting them actually eat it up. In theory that sounds fine. Recent experience tells me that this sometimes can be a productive method for catching crayfish. Canned cat food based on fish products has often proved to be an effective bait. Most experienced crayfish catchers I know prefer to use bait in the trap that crayfish can sink their teeth into. This most likely will result in a larger catch. The advantage with containerized bait, though, is that it will last longer as the crayfish can't actually get to it. Down in Louisiana's Cajun country, crayfish catching has gone commercial and professional. With an annual production of 30-50 million pounds of long clawed red swamp crawfish, they are harvested on more than 120,000 acres of wetland that also produces large quantities of rice and other grains. But when the water temperature is below 70 F, manufactured bait is not very productive. During the cold months, fish bait is better, but after lakes warm up, manufactured bait is often even more productive. Trapper Arne has experimented with manufactured bait and found it true that during the warm weather months, manufactured bait works quite well. And it certainly is easier to handle, doesn't go sour and won't mess up your hands when baiting traps. But when using manufactured bait, it is a good idea to use a bait container in the trap. Bait lying on the bottom of the trap is often attacked by the crayfish from the outside of the trap. Keeping bait in a container lures the crayfish inside and makes the bait last longer. The artificial flavorings in manufactured bait, or the oily fish too for that matter, gives off a "smell" that spreads to the whole crayfish community. This is what lures them to find the source of the smell and into the trap they go. We hope.